Toilet humour in games is always a tough thing to get right. Many have tried, and few have succeeded, as toilet humour tends to work best when used sparingly at certain moments in games, just as it is in the best comedy movies. There are a few exceptions to this rule, with Conker’s Bad Fur Day being an obvious success in its attempts to blend a twisted fairy tale with elements of farce and fart jokes. Justin Mac Fart is one big fart joke, but the problem here is not only that the joke isn’t funny, but it’s the only joke the game has got. I’m going to have to be a spoilsport here and tell you the joke, as it is fundamental to the game. You slingshot the hero, Justin Mac Fart, around the 2D levels, using his farts as a method of propulsion. That’s the joke. Believe it or not, this is actually less funny than it sounds, and even if you do find the first couple of farts funny, I am willing to bet that you won’t be laughing after you have slung him around the stage for the fiftieth time. 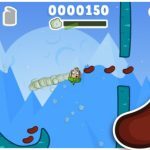 In fact, as each stage can take dozens of moves to fully complete, there is a fair chance that you will have muted the sound after a couple of levels, killing the joke, but at least preventing an incident of wall-meets-iPhone. Well, maybe the game isn’t as funny as it sounds, even to me, your hapless reviewer, a big fan of low brow TV comedy offerings such as Bottom and The Young Ones, but if the game is good, all that shouldn’t matter. Unfortunately, Justin Mac Fart just isn’t very good, either as a comedy or as a game. The game is, at its best, deeply average and dull as dishwater at its worst. 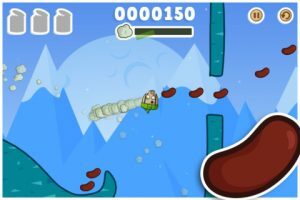 Each stage is a side-on affair, and you must guide the main character towards the outhouse exit, collecting beans and cans along the way. You get unlimited moves, although after three farts you must wait for a recharge, which means that each foray away from the platforms must be judged correctly so you have enough farts to get back to safety, or risk falling to your death at the bottom of the screen. 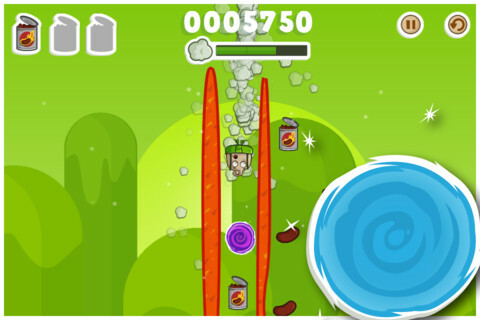 Collecting beans along the way increases your score, but the main aim is to find the cans, which are usually in hard to reach places. There are a few extra things around the levels, such as teleports which do make things slightly less mind numbing. The game is a chore to play, not because of the controls and mechanics, which are actually pretty solid, but rather because of the inane and dull level designs that are coupled with a ‘by the numbers’ feel to the stage structure and gameplay. The graphics are pretty nice, with a bright and cheerful look, and the soundtrack is fair, if a little anonymous. The designs for the characters and stages is lacklustre and uninspired, however. 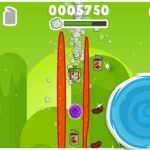 Essentially, there are hundreds of games like this on the App Store, and while this isn’t truly among the worst, it is a long way from being among the best. 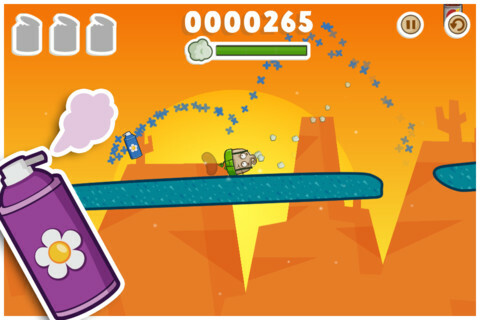 The farting noises get annoying quickly, the humour misses its target and the actual game is extremely forgettable. Overall, a game rooted in mediocrity and uninspiring design with woeful attempts at humour that will probably leave a bad smell in in your wallet if you choose to spend money on it. Check out our reviews of Coco Loco, Lightopus and Prince of Persia Classic! You can also take a browse through our developer interviews! I never understand how there can be so many apps in this genre. Who does it appeal?